It was perhaps one of the biggest events in recent times at the sprawling Chennai Trade Centre on Independence Day (August 15). Kollywood celebs and fans descended on the venue for the grand audio launch of UTV Motion Picture’s Chiyaan Vikram’s ALVijay directed, Thaandavam. The hero of the evening was GV Prakash for whom Thaandavam is his 25th album. The entire unit of the film- Vikram, Jagapathy Babu, Lakshmi Rai and Amy Jackson was there, except Anushka who is shooting in Georgia right now. Amy Jackson’s appearance in a sari (a first?) sent fans into a tizzy while Chiyaan Vikram’s dapper appearance with glasses, gelled hair with a pony tail (Shankar’s I look ?) and Lakshmi Rai’s presence, heated things up. The event was conducted to perfection under the watchful co-ordination of UTV South head, G Dhananjayan. UTV big boss Siddharth Roy Kapur had flown in from Mumbai to be present at the audio launch of his big budget movie. However the event flow was too long and went on and on as almost everybody from the film industry who came as guests made speeches. Added to that each song had long winded introduction AV’s and in some cases making of the song and in addition singers who sang it gave a live performance. And for three songs it was again performed on stage by Robo Ganesh! The event was a special one since it also celebrated the 25 year old music director GV Prakash’s 25th film album and hence apart from AV’s about the making of the film, there was a special felicitation of GV’s father Venkatesan on the occasion. Also, preceding the screening of each song and its making, a short AV was shown with GV explaining the song and its making. Each of the songs was released by a host of celebs every time, after which a live performance of the song was held by the singers concerned, with GV on the piano or accompanying them. All this added to the length of the programme (as it has to be marketed as a 3-hour television show), but it showed the producer’s special attention towards the achievement of the music director who was all smiles throughout the evening. Priyadarshan, Vijay’s mentor was the happiest man and announced, “Out of all the 86 films I have done, AL Vijay is my biggest pride and achievement in my career, as one of my prized assistants. He is like my son.” The “Yaridi Mohini” number shot in London on Amy and some white dancers is a sure fire hit. And songs like “Oru Padhi Kathavu” and “UyirinUyire” seemed to be instant hits with the audience. The latter has been picturised on Vikram and Anushka on the beaches of Dover, using the services of special sand artists. 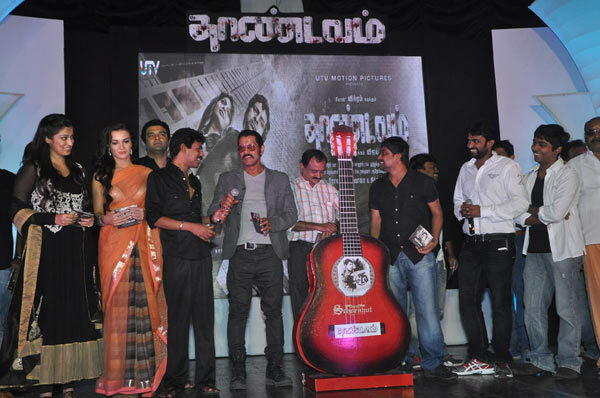 The audio was released by Bala and Lingusamy. A host of Kollywood celebs like Karthi,Hari, Bharath, Vimal, , Jeyam Raja, Sivakarthikeyan, Atharva, Nanda, Gnanavel Raja, Janani Iyer. Parthepan, Lizzy, Priyadarshan, Vasanthabalan, Musskin, P Vasu, Saranya, Ponvannan, Nasser Puskhar and Gayathri graced the event.